Recognize Substance Abuse and Get People the Help They Need With This Nationally-Acclaimed Program. Do your supervisors know what some of the most addictive drugs look like? Can they tell the difference between the employee who just likes to party and the one with a serious alcohol problem? Are you confident they’d know how to confront someone who is using alcohol or drugs at work? This program, originally developed for the Norfolk Southern Railroad Corporation, gives your supervisors the skills they need to deal with all those problems, and more. Drug photos, categories, symptoms, etc. Includes Vital ReproEditable™ Handouts V001,V002, V004, and V014. ALL PROGRAMS AND PRODUCTS COMPLETE WITH 100% MONEY-BACK GUARANTEE! Click for FREE Full Preview. This is a shorter program for employers needing solid and impacting drug alcohol supervisor training but without the length and depth of the DOT supervisor training package. It's a fact, if you have over 15 employees, you have some that are using alcohol and drugs at work or they have addiction problems off the job that impact your company. They are both equally problematic because they reduce productivity, increase risk of accidents, drive workers' compensation costs up, and permeate your organization at multiple levels including conduct, behavior, attitude, violence, and anger management issues. And the list goes on. Even if an employee is not using alcohol and drug at work, withdrawal symptoms can lead to disaster if they abuse these substances off the job. You don't have to be helpless. You can be proactive with this training kit that includes everything you need. ONE HOUR NON-DOT TRAINING HANDOUT FROM COURSE - EXAMPLE HERE. Supervisors must be trained to have the right understanding of substance abuse in the workplace so they do not back off, but instead feel empowered to be proactive with assertiveness so they address these problems when employee symptoms become evident. This the BIG WHY of this product. • Successful intervention techniques for substance abusing employees..
How to Offer non-DOT Alcohol and Drug Training and Why at Work? Training supervisors to recognize alcohol and drug problems at work can be done with PowerPoint, DVD, Video or a web course that uploads to your own internal website. • Offers handouts and tips sheets are some of the most perplexing issues supervisors face along with the answers to what to do and say. • This all-inclusive, step-by-step program will allow you to ensure your supervisors know how to recognize substance abuse, intervene early, and help prevent nightmares the workplace. Employees who suffer from drug- or alcohol-related issues are more prone to attendance problems, increased accidents, and therefore experience reduced productivity. Statistics show that these employees use three times as much sick leave and have worker’s compensation costs that are five times higher than employees without alcoholism. This combination of lower productivity and increased company insurance costs can be detrimental to the company and the costs have an array of indirect impacts. Employee negativity, conflicts at work, and even sexual harassment can all be linked to underlying substance abuse problems. These are excellent examples most management and leadership fail to completely understand, and are rationales for educating supervisors and employees about workplace substance abuse. Alcohol, a central nervous system depressant, is a toxin in large quantities and a progressively addictive substance. Unfortunately, no one can make an alcoholic stop drinking except the individual afflicted with the problem. However, intervention to confront the alcoholic about his or her performance issues in the workplace is a powerful and leveraging step that work to motivate employees to get help. This shock an alcoholic out of denial, but must be done so by a trained professional. 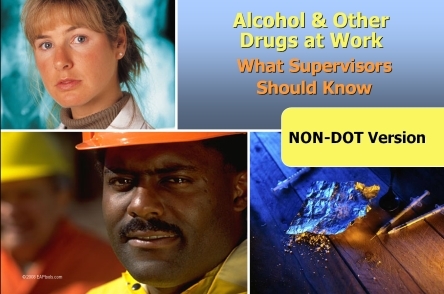 This “non-Drug and Alcohol Training for Supervisors” offers proper training to overcome this problem in the workplace. Addressing substance abuse issues at work is vital for optimizing the workplace atmosphere as well as employee efficiency. The materials offered as a part of the Drug and Alcohol Training for Supervisors program provide new and advanced techniques in battling the problem. They will help educate the supervisor on how to outline and establish a fair and consistent procedure for properly confronting employees when necessary. The three key benefits of this non-DOT Drug and Alcohol Training program include proper supervisor-employee substance abuse recognition, confrontation, and referral to the organization's approved source of help, like the employee assistance program. A number of risks may be attributed to substance abuse in employees. These include productivity decline, increased health care costs, possible fatal accidents, extra sick leave, absenteeism, and poor decision making, to name a few. The informative alcohol and drug training for supervisors program offers indispensible tips and guidelines to an safer workplace. 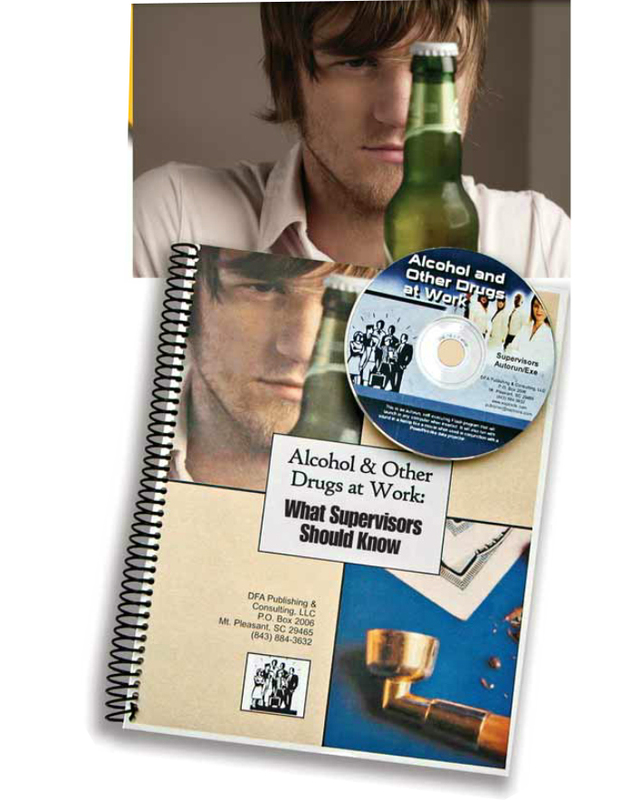 Other products at WorkExcel.com to help supervisors understand and confront substance abuse problems in the workplace.